A reputation-making magic trick! A small glass full of liquid is shown to the audience. They can inspect it thoroughly, if they so choose. 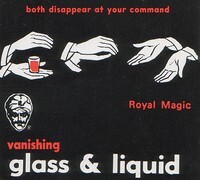 Holding the glass in an outstretched hand which is otherwise empty, the magician then promptly vanishes the glass - liquid and all - by squeezing his palms together. One minute the glass is there, the next it's gone. Comes complete, ready to work. A classic magic trick. This product was added to our catalog on Tuesday 28 October, 2003.